Why should you buy our iPhone X wallet case? iPhones have moved from technological innovation products to an essential piece of modern living. iPhones are one of the most reliable devices that you can buy. The release of iPhone X set records for selling in huge quantities. If you’re a dedicated iPhone X user, you would like to get it protected. The best way is to utilize the best iPhone X Wallet Case that can help you easily manage your essentials, including your delicate smartphone. You may get frustrated when it’s time to go outside, and you can find your wallet but not your phone. In this situation, the Caseme iPhone X Wallet Case makes it easy to keep everything in one convenient location. Not only will your iPhone X be protected from impact, but you’ll also protect your mobile’s screen from scratches and other damage. 1. Having this unique case for your iPhone X will help you avoid damage to your smartphone. 2. 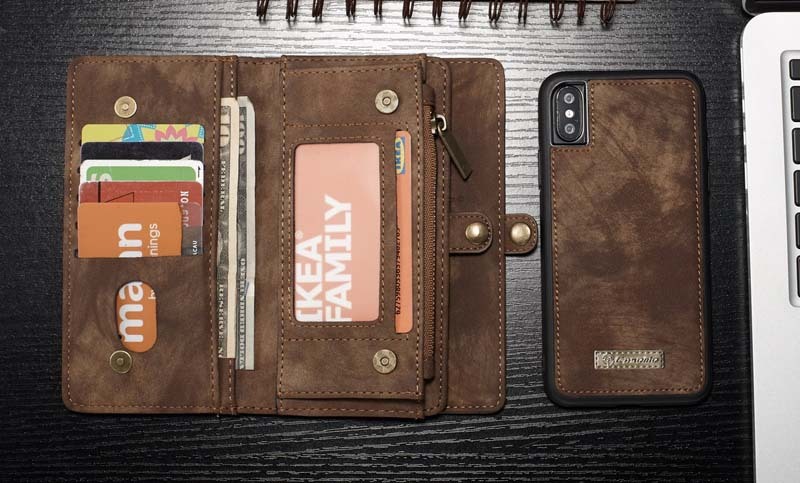 With this iPhone X wallet case, you’ll be sure to have a nice looking and great functioning phone. 3. Your iPhone X wallets’ size will be directly proportionate to the amount of cards that you want to carry with you. 4. You’ll never have to worry about the security of your iPhone X, when you use this iPhone X wallet case with a belt clip. 5. This wallet case will fulfill all your needs to carry your smartphone and cards with you at all times. 6. This case is super- protective, and fits your budget and style. 7. This wallet case has been specially designed in Britain to best combine elegance and usefulness. 8. The smart rubber padding protects your iPhone X against sudden falls. 9. The wallet case comprises of a strong internal shell of the bumper cover being attached to a leather pocket. 10. The case is perfect for daily use, since its buttons are covered to ensure the mobile’s protection against dust and scratches. 11. The lightweight leather wallet gives you a comfortable grip on your gadget.